Great family home close to town, skiing and fishing, perfect for your whole family gathering of friends or small group. Gull Lake Custom Craftsman Winter at the Gull Lake Custom Craftsman. Vehicles with 4x4 or chains may be required in the winter. Cozy living room with fireplace and plenty of seating space. Dining area for family dinners Gourmet kitchen with everything you need Master bedroom-downstairs with separate attached bath. Bunk room with two bunk beds. Perfect for kids. Downstairs bath used by bunk bed room TV room/den downstairs with pull-out couch Master bedroom-upstairs with balcony. BBQ is on this balcony. Master bathroom upstairs, also used by living area. Come see why June Lake is called the Gem of the high Sierra. Our resort town is best known for the beautiful mountain scenery, the outstanding fishing, as well as the snowy winters. Within less than one mile you have access to two glacial lakes full of trouts, a marina, the June Mountain ski area and all of the best things this little town of June Lake has to offer. This newer custom vacation home is located in the best location for your family or small group to enjoy every season. June Lake is a small village tucked back between alpine lakes and the stunning Sierra mountains. Our area has been a trophy fishing destination for decades. June’s lakes and creeks offer Rainbow Trout, German Brown Trout, Cutthroats, and Alpers Rainbow trout. The more adventurous type can go to an even higher altitude to find Golden Trout, the California State fish. Hiking trails are also plentiful in the area, and for every type of ability. You can stroll around Gull Lake, hike a few miles to many alpine lakes, or go the whole day into the back country to the John Muir Trail or Pacific Crest Trail. There is also wildlife viewing, mountain biking, road riding, boating, rock climbing, and off-road motor trails. Stay when the nights get cooler in June Lake to see the fabulous fall colors as well as excellent fall fishing. Not only will the fall colors will take your breath away, stay to see the snow fall in June Lake. June Mountain ski resort is a short five minute drive from this house, that has open runs great for those powder days. Bring the whole family to ski favorite runs like Matterhorn, Schatzi, or Rainbow Ridge. 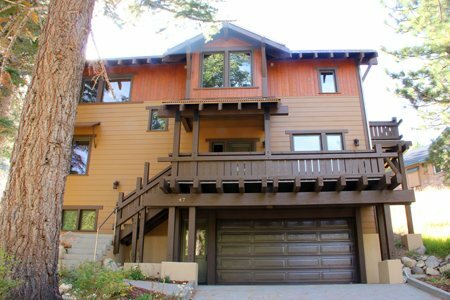 June Lake is the true mountain experience your family is looking for, and this exceptional house will make those memories that much better. Entering this custom home you will find a large entry with two rooms and a den. The den has lots of seating and a 36” flat screen with a DVD player. To the right is the first bedroom with a queen bed, a fully attached bathroom, walk-in closet, and a 22” flat screen. The other room on this entry level has three twins and a double bed, making this a great room for kids. Next to this room is a full bathroom as well as a closet with a brand new washer and dryer. Continuing up the stairs is the great room, dining room and kitchen. This open floor plan makes it great for entertaining family or friends. There is plenty of seating with chairs, a couch, and love seat surrounding the gas fireplace. This room has a 40” flat screen with Blu-ray and DVD players, as well as wireless internet. The kitchen is modern and fully equipped. Off of this room is another master bedroom with a queen bed, and attached bathroom. There is also a small balcony off of this room. Stay in the eastern sierra in luxury and mountain style! We loved it. Great house for 2 families! Even the Bunkbeds were comfortable which is not the norm! Love the house, will definitely be back next year. YOUR TEAM WAS GREAT, WOULD BE HAPPY TO RENT FROM YOU AGAIN. WE ENJOYED OUR STAY VERY MUCH. THE HOUSE WAS BEAUTIFUL COMFORTABLE AND GREAT LOCATION COULD NOT HAVE ASKED FOR BETTER!! The cabin was lovely and just perfect for our family! Your Team are more like good friends! Leslie did an excellent job in getting us situated. We've been coming to June Lake for over 40 years now, and wouldn't consider staying with anyone else! 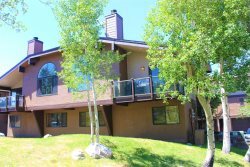 Staying at your properties only serve to enhance the overall June Lake Experience. They are cleanest, well kept, most comfortable, reasonably priced accommodations that anyone would ever want in the Eastern Sierras. We've already booked the same property for 2018! MANAGERS RESPONSE: Thank you for your kind comments! We'll see you next year! This is our 3rd year renting the "Gull Lake Craftsman" My family loves it!! Plenty of room, 3 bathrooms & a washer & dryer....everyone loves the house!! A great vacation that I look forward to every year. Our family had a pleasant experience with the property team members. Our stay was relaxing and comfortable. Excellent and knowledgeable. Super prompt at responding to emails. The house was absolutely beautiful, so clean, so comfortable, a very well-stocked kitchen. The views were stunning. Wonderful having the garage, such a great place to stay. Thank you! Sierra and Lydia are both super friendly and helpful. Thank you very much!!! I love your team. Don has been wonderful in the past and all his team members are very sharp and knowledgeable to the happenings in June Lake and Mammoth areas. Very accommodating to my family. Your team member was very accommodating and she even went out of her way to show us another property that we will stay at this next year. She was wonderful. Great choice and hiring of employees. MANAGERS RESPONSE: Thank you for your kind words. We feel very fortunate that we have great employees. We'll see you again soon!! This property had comfortable beds from upstairs to downstairs and the bunkbeds were of good quality. We decided to stay in this particular home because it accommodates eight people comfortably or more. We will rent that place again plus another property of yours. Excellent service and friendly women at office upon check in. One of the best vacation stays we have had in the Sierras yet! Look forward to another great experience in the near future with my family. The house was absolutely gorgeous. Very comfy and accommodating for all of us. Thank you, would love to come back, but later in the summer when its not so hot. Thanks again! Love this house. We've rented it several times and it's a fantastic place to take a vacation.